MARTHA MOMENTS: Love These Glasses! In the December issue of Martha Stewart Living there are two removable pamphlets - advertisements for some of Martha's Christmas wares at Michael's and Macy's. (For archivists of all-things Martha, little clip-out brochures and catalogues like these are treasures.) Among my favourites is this set of glasses from the Martha Stewart Collection at Macy's. 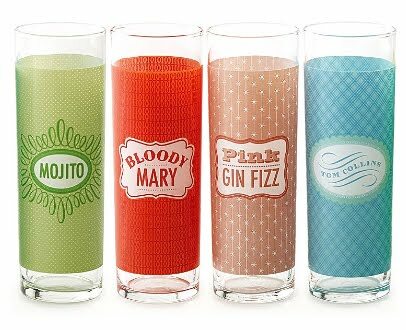 The four-piece recipe glass set (Bloody Mary, Mojito, Tom Collins and Pink Gin Fizz) retails for $16.99. An accompanying serving tray for hors d'oeuvres goes for $24.00. I love the colours, narrow shapes and vintage designs. Andrew I just purchsed these yesterday with the plates for a Xmas present for a friend ... they come wrapped with a Martha Stewart collection gift tag too -- I also picked up the stuff Francesca and Sharky .. they are very cute!